Chapter 1 – Emerging Technologies – the Way Forward on Improving Protein Analysis (G. Marko-Varga). Chapter 2 - Capillary High-Performance Liquid Chromatography for Proteomic and Peptiodomic Analysis (C.G. Huber et al.). Chapter 3 - Peptide and Protein Separations by Capillary Electrophoresis and Electrochromatography (A. Vegvari). Chapter 4 - Two-Dimensional Gel Electrophoresis: The State of the Art (C. Bratt). Chapter 5 - Phosphorylation-specific Analysis Strategies for Mass Spectrometry: Enhanced Detection of Phosphorylated Proteins and Peptides (A. Stensballe, R.J. Simpson). Chapter 6 - Microtechnology Principles and Platforms for Proteomic Analysis (T. Laurell et al.). Chapter 7 - Clinical Peptiodomics: Peptide-Biomarker Discovery in Blood (I. Schulte et al.). Chapter 8 - High Resolution Mass Spectrometric Approaches to Glycoprotein Characterization (C.L. Nilsson). Chapter 9 - Mass Spectrometry for Protein Identification (F. Levander, P. James). Chapter 10 - Technologies Interfacing Capillary Electrophoresis to Mass Spectrometry (A. Vegvari et al.). Chapter 11 – Protein Bioinformatics (L. Malmstroem). 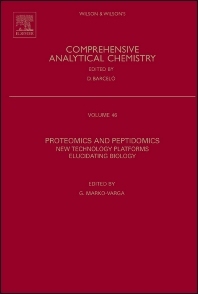 Chapter 12 - Bioinformatics Standards and Tools in Proteomics (F. Potthast). Chapter 13 - Simulation as a Tool for Optimizing Proteome Analysis (J. Eriksson, D. Fenyo). Chapter 14 - Proteomics and Remodeling of Extracellular Matrix in Lung Diseases (J. Malmstrom). Chapter 15 - Mammalian Cell Biology and Proteomics (J.S. Burns). Chapter 16 - Clinical Cancer Proteomics(A. Alaiya, S. Linder). Proteomics and peptidomics is the detailed understanding of the role that proteins and peptides play in health and disease and is a necessary compliment to genetic analysis. The functional expression analysis of both proteins and peptides plays a central role in modern drug discovery as well as drug development, and is also a key research area in systems biology. Proteomics and Peptidomics captures the width as well as the depth within the area and exemplifies the variety as well as the traditional basis of analytical chemistry that is needed in order to move forward in expression analysis studies. As a fast emerging field, it gives and overview of parts within the field combined with highly specialized and dedicated topics that are intended to compliment each other.